Inducted 2004. Two-Time All-Stater in Softball, Three-Time All Conference at Eastern Illinois. Class of 1987. When the discussion of great female athletes in Quincy Notre Dame history comes up, the name of Carrie Voisin is one that is often — and unfairly — forgotten. However, her career numbers are very comparable to many three-sport stars who have worn the blue and gold. Voisin, a 1987 graduate, played softball, volleyball and basketball. She was a three-year starter in basketball and ranks 20th in school history in points scored. She still ranks among the school leaders in career kills and blocks in volleyball, and she was named her team’s most valuable player during her senior season. Her biggest success came on the softball diamond. 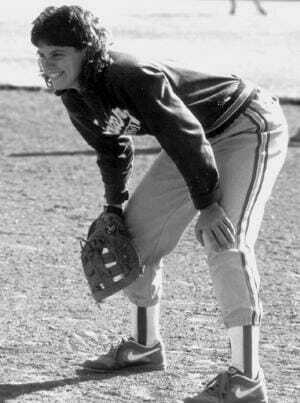 She had a .434 career batting average and 15 career home runs — both among the tops in school history. As a junior, she had 52 hits (the second-best single-season mark in school history), 9 triples, 8 home runs and batted .476. She was named to The Quincy Herald-Whig’s All-Area team and the Chicago Tribune’s All-State team as a junior and as a senior. She helped the Lady Raiders place third in the state tournament as a sophomore. Voisin went on to play softball for four years at Eastern Illinois University and was a three-time All-Gateway Conference section. As a junior first baseman, she was one of 22 players from eight states selected to the All-Midwest Region team. Voisin now lives in Springfield where she is an art teacher at the Feitshn-Edison Magnet School. Long before I arrived in Quincy in the winter of 1985, QND’s reputation as a model for Christian education was well-known throughout central Illinois and beyond. Word on the street was, “QND offers an excellent curriculum and a very strong girls sports program.” Five semesters later, I would leave Quincy with the knowledge, strength and self-confidence to further my education and dreams of becoming a Division I college athlete, teacher and later earning a Master’s degree in educational administration. To all the administrators and teachers of this fine institution, too many to mention, I owe everything. Thanks to all of you from the bottom of my heart.